This is my round 2 entry for FoodBuzz's Project Food Blog Challenge. Please vote for me between September 27th and 30th so I can keep moving forward! It may sound like I'm angling for an unfair advantage here, but despite the fact that I'm ethnically Chinese, Chinese food is the cuisine that I'm most intimidated to cook. I'm fourth-generation American: I grew up in an all-white neighborhood, the closest thing I have to a second language is French, and the first dish my mom taught me to make was spaghetti with meat sauce. I didn't even attempt to cook Chinese food until I was in my late 20s, and somehow it always came out tasting like European food with soy sauce on top. In order to make sure I was really getting into the spirit of Challenge #2, I decided to attempt something truly unfamiliar to me: Yunnanese food. 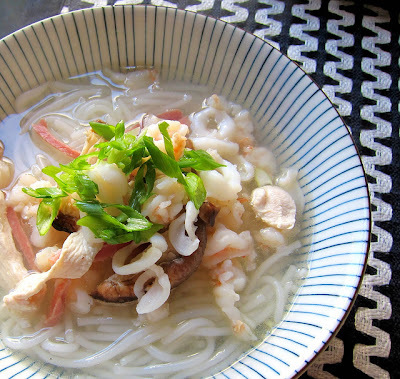 Yunnan is a province of China, located on the southern border, but its cuisine has not made many inroads in the United States the way Cantonese and Szechuan food have. I've never even tasted Yunnanese food, much less attempted to cook it. Still, I've read all about their famous Crossing the Bridge Noodles many times in the course of my extensive noodle research, and I pretty much jump at any excuse to discover a new noodle dish. The chicken broth was incredibly familiar to me; it's essentially the same broth I use to make my basic Chinese chicken noodle soup. 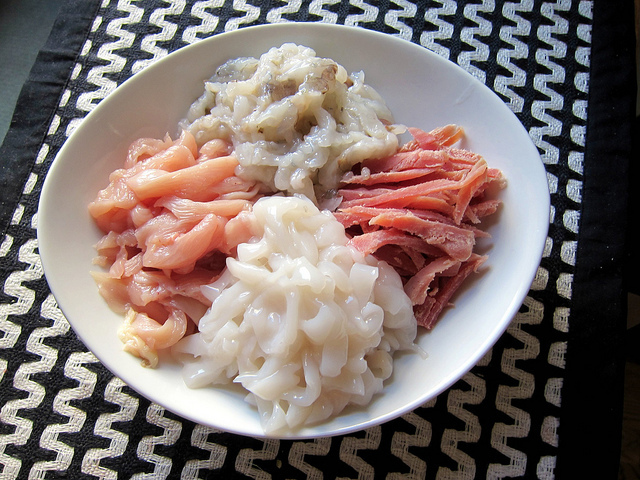 But several of the other elements were new to me, particularly the Chinese ham, which is a specialty of Yunnan. Here in the States, we can substitute Smithfield ham from Virginia, which has a lovely, smoky taste. The noodles I tracked down after looking at a couple of helpful Flickr photos indicating the general shape and size. Lastly, I faced my bête noire in the kitchen: squid. My one experience cleaning squid (slimy, disturbingly anthropomorphic) left me feeling like a contestant on Fear Factor, and I don't seem to know the secret to keeping it super tender instead of rubbery and overcooked. Finding a recipe for Crossing the Bridge noodles was surprisingly hard, which is probably a reflection of Yunnanese food's relative obscurity outside of China. A Google search didn't really yield many helpful results. I found versions in three of my cookbooks, and stuck quite closely to the one in The Food of China, which looked like the most authentic of the three. 1. Place the bones from an entire chicken (I also like to use the wings, as their meat isn't useful for much else) in a 4-5 quart stockpot and add the green onion and ginger. Add water until the chicken is barely covered. 2. Bring water to a boil, skimming off any scum that appears at the top. Cover with a lid and turn heat to low. Simmer for an hour to an hour and a half. 3. Add salt to taste. I added about a teaspoon of kosher salt. Optional You can save the chicken skin and fat from the carcass, render it in a small pan, and spoon the fat over the finished noodle dish. All of the recipes I read said this step was unnecessary, but I tried it, since I had all the ingredients handy. It maybe added a bit of richness and depth to the broth, but probably isn't worth making an extra dirty dish for. Traditionally, the meats are cooked in the actual bowls at the table (similar to the way rare beef in pho is served). Because I was unfamiliar with the dish, I chose to play it safe and cook it before serving. Cooking the meats via residual heat (vs. at a full boil) definitely gave them a lovely tender texture, making this my first successful use of squid! 1. Slice all the meats (shrimp, squid, chicken, ham) into small slivers. You will be using the hot broth to cook these, so they must be fairly thin. 2. Soak the mushrooms in boiling water for half an hour. Squeeze dry, remove the stems, and cut the caps into slices. 3. Bring a pot of water to boiling, then cook the noodles according to package instructions. If using fresh noodles, they will only need to be dunked for about 10-15 seconds before straining. 4. Transfer a little under one cup of broth per serving into a small saucepan, cover, and bring to a boil. As soon as the broth comes to a full boil, drop in the sliced meats, turn off the heat, and let stand, covered, for about 2 minutes, or until the meat is cooked through. 5. To serve, place a small handful of sprouts in the bottom of a bowl. Top this with a bundle of cooked noodles. Then add a spoonful of cooked meat and shiitake mushrooms. Lastly, spoon over about a cup of hot broth and scatter with sliced green onions. Serve with spicy chili oil. ust ate Crossing the Bridge noodles at Yunnan restaurant Southern Barbarian in Shanghai - yours looks just like it! Well done! Voted for you!